If weight is given without FUNCTION then weight behaves like boost_factor. 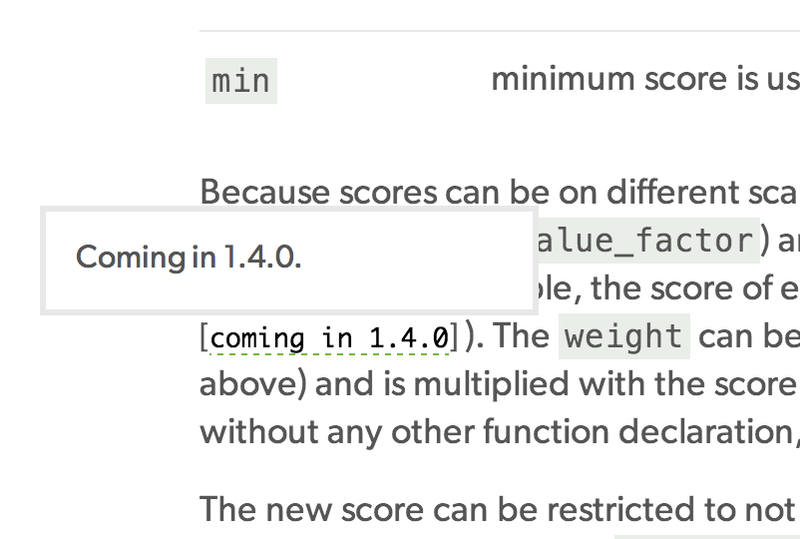 Because scores can be on different scales (for example, between 0 and 1 for decay functions but arbitrary for `random_score`), the score of each function can be adjusted with a user defined `weight` (added[1.4.0]). The `weight` can be defined per function in the `functions` array (example above) and is multiplied with the score computed by the respective function. The arbitrary scale for random_score might be fixed soon so maybe we should rather give another example? Why do you use Double.compare instead of ==/!= ? You added the weight as a common property of all functions, but I'm wondering if that wouldn't make more sense to keep that out of ScoreFunction and to apply the weight on top of the function. For example, maybe we could have a WeightFunction that would wrap a weight (double) and another function, and when a weight that is != 1 would be provided, we would wrap the function in a WeightFunction instance? Thanks for the review! Implemented all suggestions. Should it mention the wrapped function as well? The explanation contains the wrapped function already, example below. Is this what you meant? In the example the string describing the decay function misses a [, will fix in a different commit. "description": "max(0.0, ((10.0 - MINMath.max(Math.abs(2.0(=doc value) - 1.0(=origin))) - 0.0(=offset), 0)])/10.0)"
So, this is an artifact left over from copying BoostScoreFunction.The method is actually not needed at all. I will remove it. This way, toXContent would be all that needs to be called to serialize a ScoreFunction and the functions that want to override buildWeight could still do it? Given that score/explainScore/setNextReader need to check whether the function is null, maybe it would make sense to keep this class but assume that the function is never null, and add a new specialization that simply holds a weight? Or alternatively, when a null function is provided in this class replace it with a function that always returns 1 as a score? Yes, changed in "insert score function that always scores 1.0 if no score function..."
This is a weird hashCode? The int bits of +0.0f are 0, so this should be equivalent to return Float.floatToIntBits((float) getWeight()); I think? Indeed, it is another leftover from copying BoostScoreFunction that I did not check. I removed equals() and hashCode() in WeightFactorFunction and BoostScoreFunction because it is not needed anywhere. Rebased on master and fixed the explain test now. Ready for the next review. @@ -9,7 +9,7 @@ the score on a filtered set of documents. "but with additional capabilities such as"
I've learned recently that this should be "coming[1.4.0]" and then the release build process will change it to "added"? neat! I did not know. Because scores can be on different scales (for example, between 0 and 1 for decay functions but arbitrary for `field_value_factor`) and also because sometimes a different impact of functions on the score is desirable, the score of each function can be adjusted with a user defined `weight` (added[1.4.0]). The `weight` can be defined per function in the `functions` array (example above) and is multiplied with the score computed by the respective function. I don't know if the "added" label can be in the middle of a sentence? Have you tried generating the docs to see what it looks like? If weight is given without any other function declaration, `weight` acts as a function that simply returns the `weight`. This seems like an odd feature to me. What boost_factor like this before? Could we instead give an error? You can ignore this comment, as I learned that this matches the existing behavior of boost_factor. "'boost_factor' and 'weight' cannot be used together. Use 'weight'"
Thanks for the review! Addressed all comments and ready for round four. _timestamp, _index and _size can be dynamically enabled or disabled. Since this is part of the client API, I think it needs to be implemented?